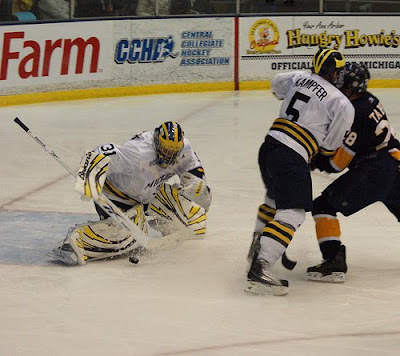 The Blog That Yost Built: CCHA Champs! This kid is a f***ing legend. U-M is going to get placed in a bracket with BC and NoDak... that my friends, in FIFA World Cup speak, is the "group of death". Or in with Wisconsin and St. Cloud. I'll leave that for the committee. Tonight, we celebrate. Or in with Miami and Bemidji. One can hope. Who cares what bracket we're in? We're in. It's not like we did a damn thing with our #1 seed last year. Win and move on, until there are no more games to win. Go blue. Michigan is playing with house money at this point...I'm just glad to see the NCAA streak lives on at 20; never would've guessed that to be a remote possibility as little as two weeks ago. For all of us who claimed that Michigan hockey was dead earlier this season, we all owe this team a huge apology. Down the stretch they proved that they we as deserving as any Michigan team to get to the NCAA. I've had more fun watching this team (these past few weeks) than any other in quite some time. GO BLUE! I think they would tell us that we were right for doubting their effort, but thank you for sticking with us. They have surpassed last season and have redeemed themselves. Now they need to win 2+2 and we'll be talking about the greatest season, ever. Even if they don't, they regained my respect.